Woolworths, the owners of now defunct hardware chain Masters, may disagree but a new report says Aussies love to renovate their homes. The study, by Roy Morgan Research, found that some 8.4 million (or 62 per cent) of Australia’s 13.6 million home owners did some kind of renovations in the past year. The figure was up from 7.5 million (57 per cent) three years earlier. The results also vindicate renovation programs like The Block that have continued to be a ratings bonanza for broadcaster Channel Nine who recently confirmed the show’s return for 2017. According to Roy Morgan, minor alterations are the most popular kind of home improvements, undertaken by just over 5.8 million (43 per cent) of home-owners over the past year, an increase of 700,000 people since 2013. Painting is next on the list: more than 3.7 million home-owning Aussies (27 per cent) painted internal and/or external walls, window sills, ceilings etc, up on almost 3.5 million three years ago. Shelling out for plumbing and electrical work is also common (3.4 million home owners respectively), while 2.9 million people engaged in more decorative refurbishments such as installing new curtains, carpet or wallpaper. Just over 2.2 million home-owners (17 per cent) spent more than $5,000 renovating or extending their home (300,000 more than in 2013) – a figure that rises to more than a quarter (26 per cent) of those who’ve been living at their current address for less than 12 months. In contrast, just 14 per cent of those who’ve been at the same address for five or more years have paid the big bucks for home improvements. 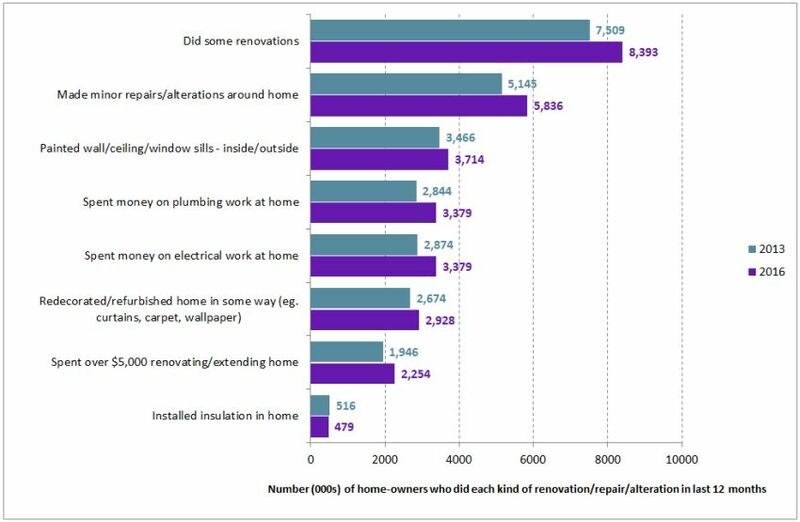 Newly installed home-owners (less than a year at their current address) are more likely than their longer-settled counterparts to have redecorated/refurbished their property (31 per cent), done any painting (31 per cent), and to have spent money on electrical (32 per cent) or plumbing (28 per cent) work in the last 12 months. Not surprisingly, people who own a separate house (62 per cent) are more likely to have renovated or made home improvements than those who own a villa unit/terrace (56 per cent) or flat (54 per cent). This is consistent for all kinds of home improvements, from the most minor repairs to major $5,000-plus jobs.